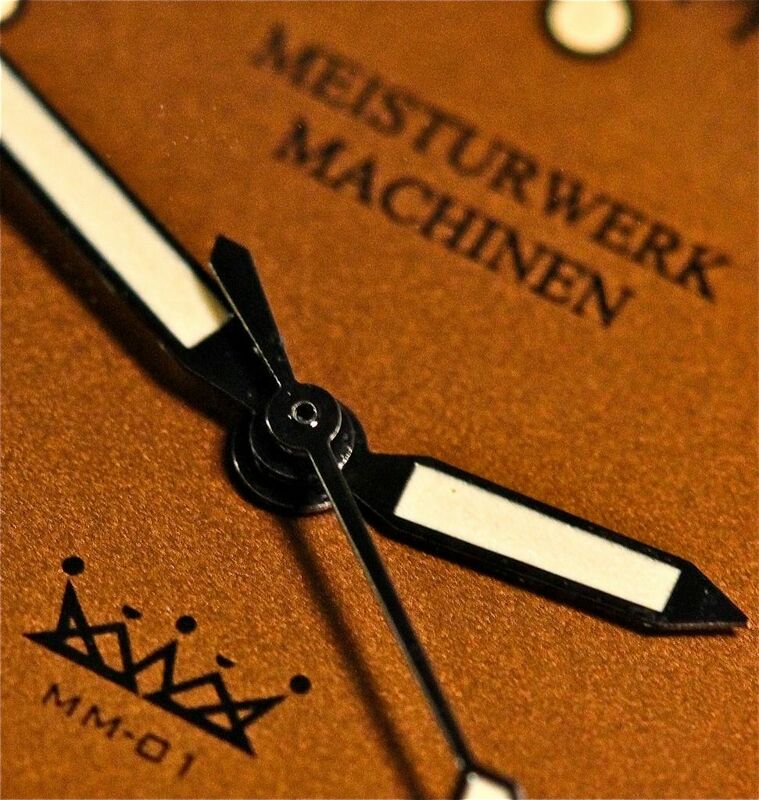 The limited edition 200 unit production of Meisturwerk Machinen’s “MM-01” timepiece is the first of many models to come from this ever expanding label. 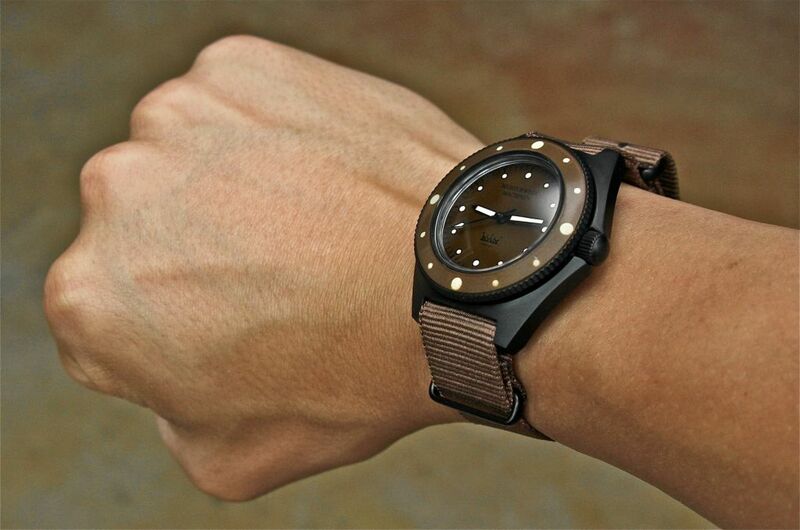 MM-01 was inspired by and re-imagined from the historical instruments that faithfully followed U.S troops on many dangerous reconnaissance missions into the jungles of Vietnam circa 1954-1979. 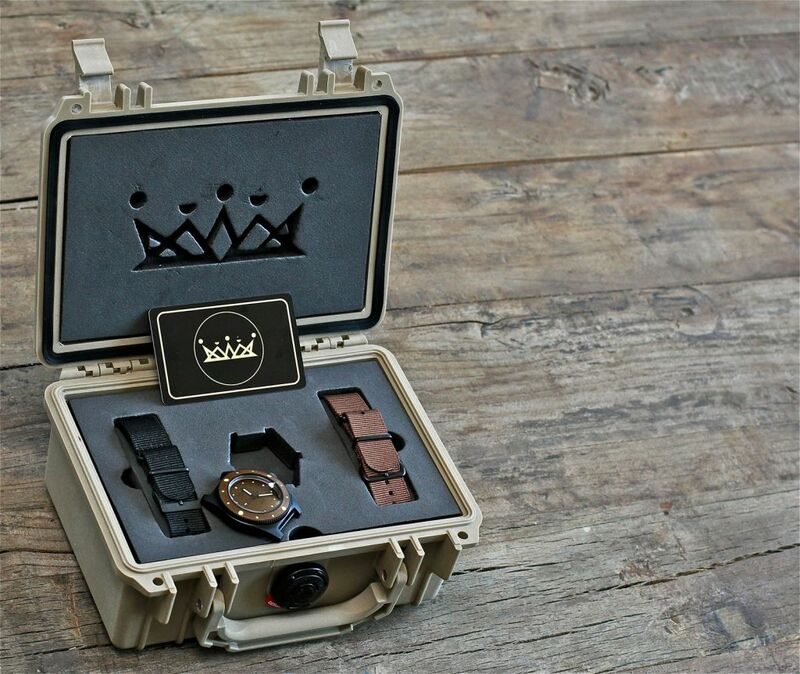 This instrument pays tribute by utilizing a similar front loaded case construction to those military issued watches worn during this era. 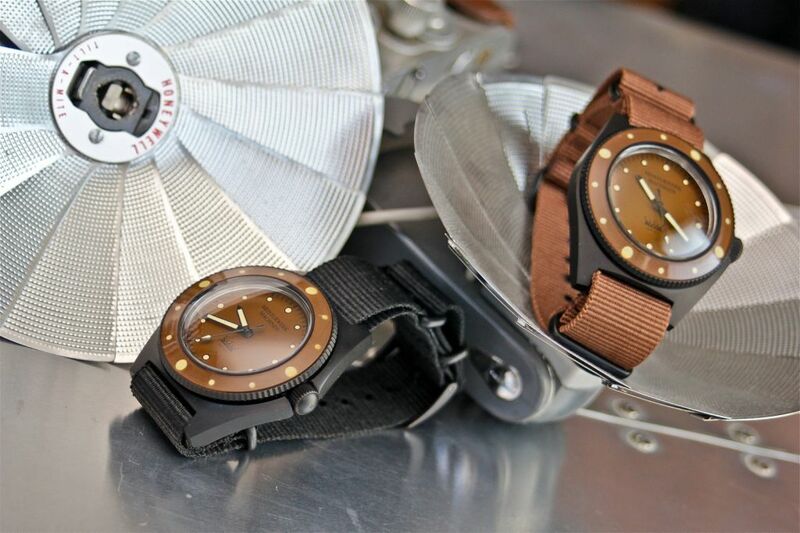 With a pressure tested 3 piece case, anti-magnetic movement assembly, rotating friction bezel, and a dial & bezel insert that seeks maximum readability, this dive watch is meant to be a purposeful tool-watch. 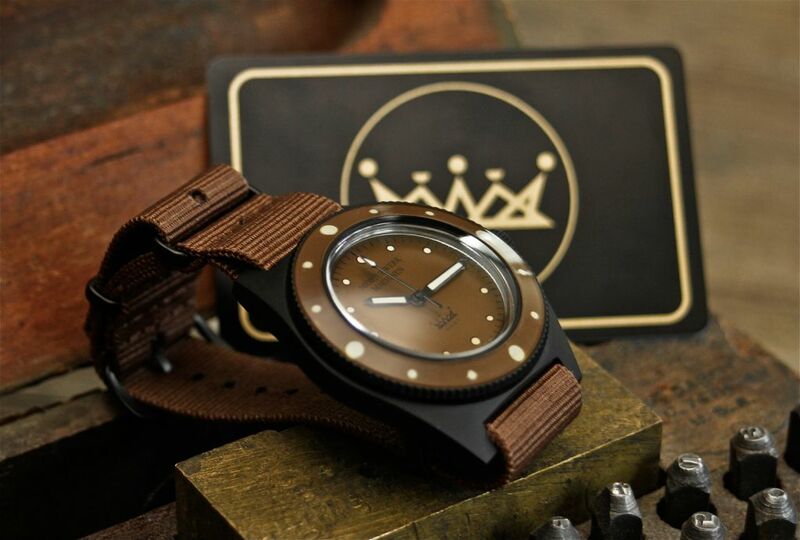 This timepiece was created specifically to honor those soldiers who fought in the Vietnam War as these hand crafted timepieces exude nostalgia as they are reminiscent of the units that were issued during that period. 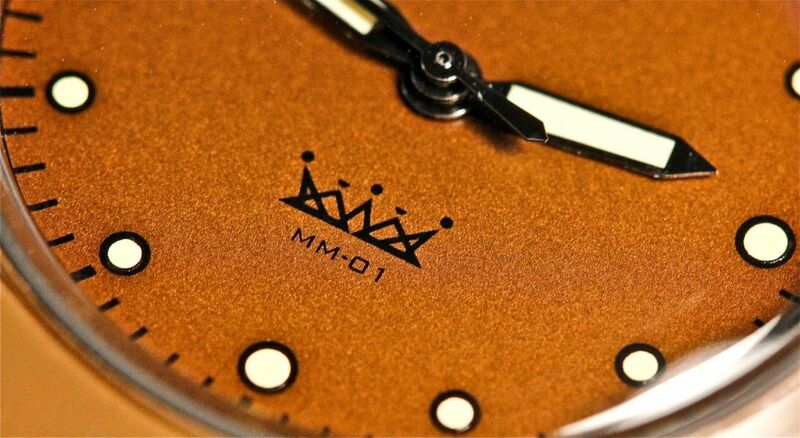 While the MM-01 design remains minimalistic, it reminisces of a time that has presently subsided. 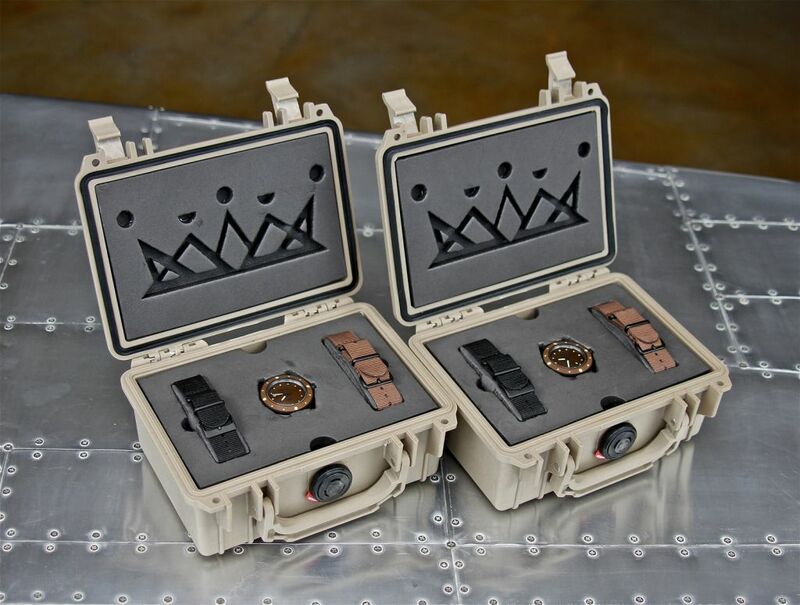 PACKAGING : The MM-01 comes in a genuine Pelican water-tight protective case with a lifetime warranty. 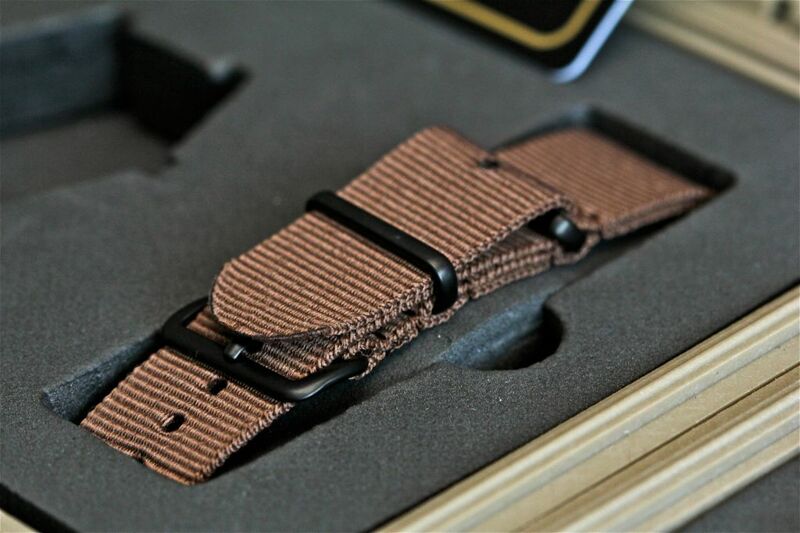 Inside the indestructible Military colored Desert Tan case lies the centered MM-01, 2 military style color matches nato straps with matching PVD hardware, a personalized credit card style 1-year international warranty card with detailed warranty information and a lower tier storage compartment perfect for storing straps or tools. 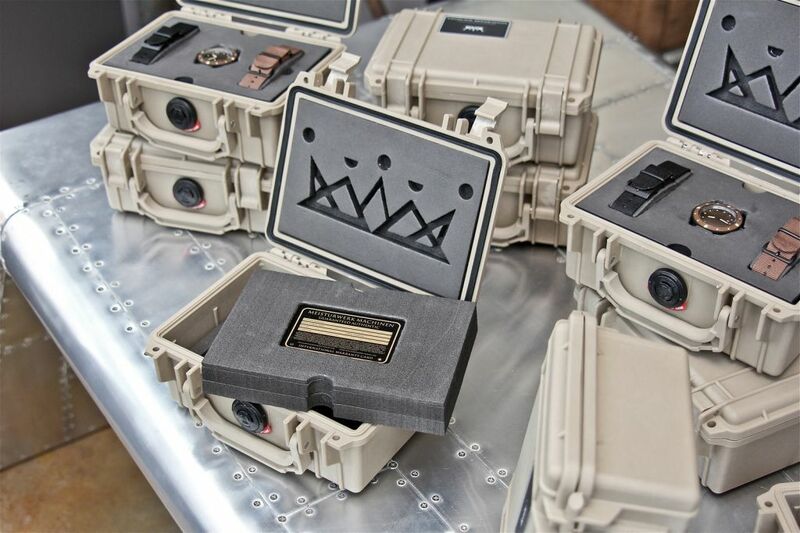 The MM-01 package includes three custom laser cut cross-link foam panels, designed and engineered in house, comprising two tiers and one monogrammed lid panel. 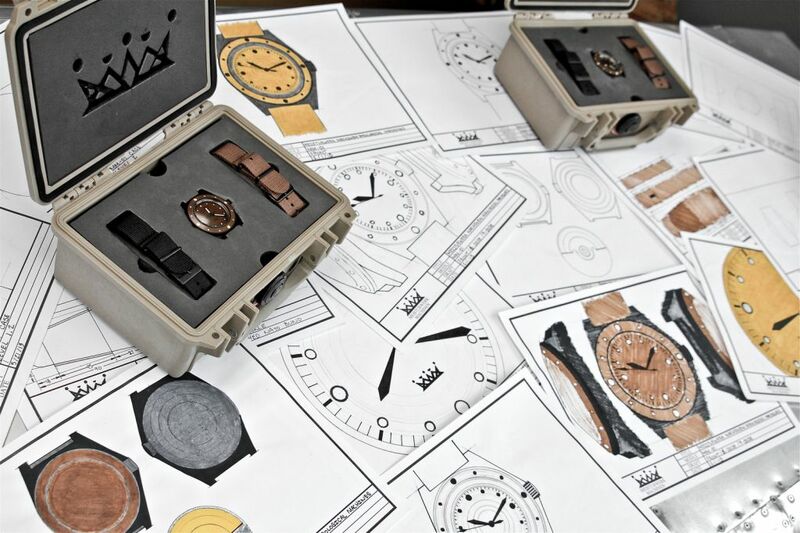 The lid panel is laser cut with Meisturwerk Machinen’s royal crown logo while the top tier displays and secures the watch head & both straps. 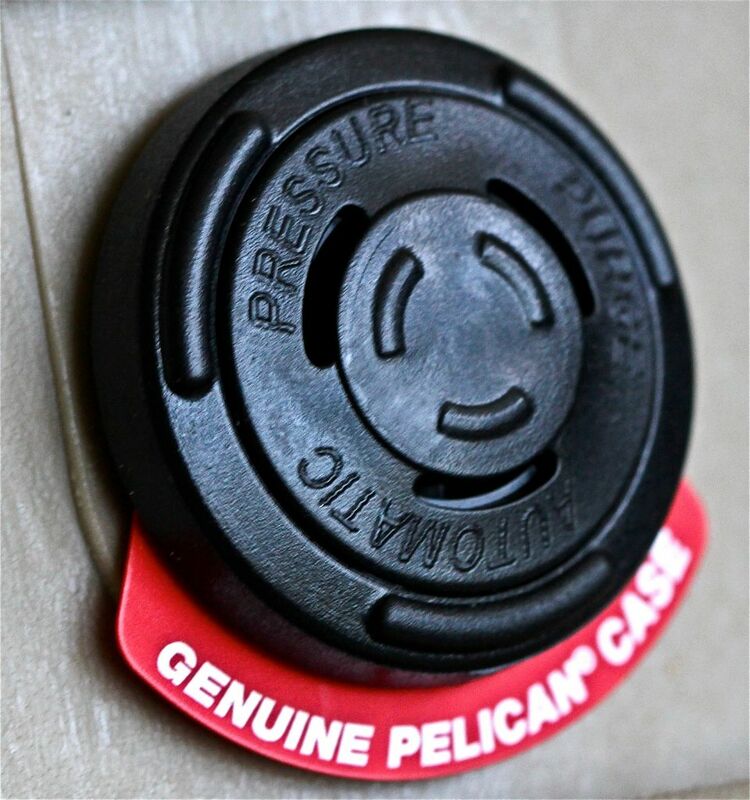 On the underside of the top tier you will find the warranty card while the lower level poses as the storage compartment for your tools & straps. 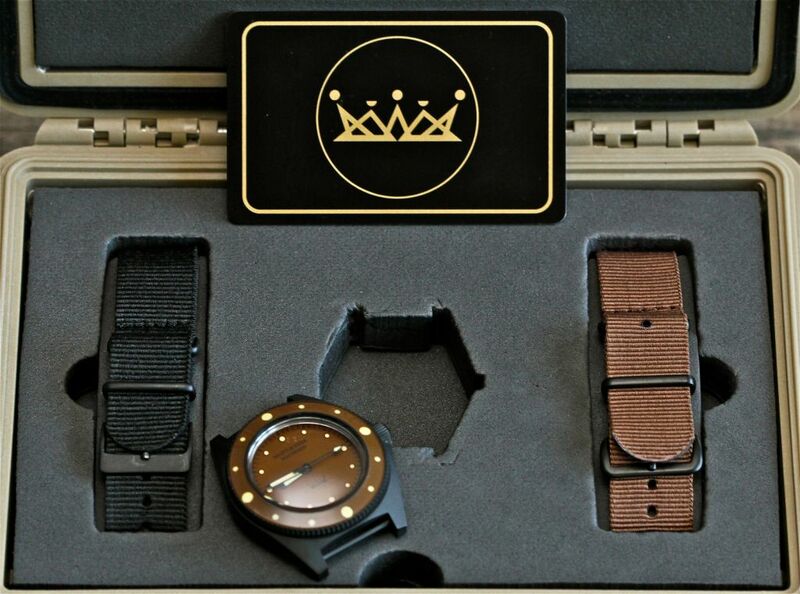 Interior dimensions of the case are : 7.25” x 4.75” x 3.06”. 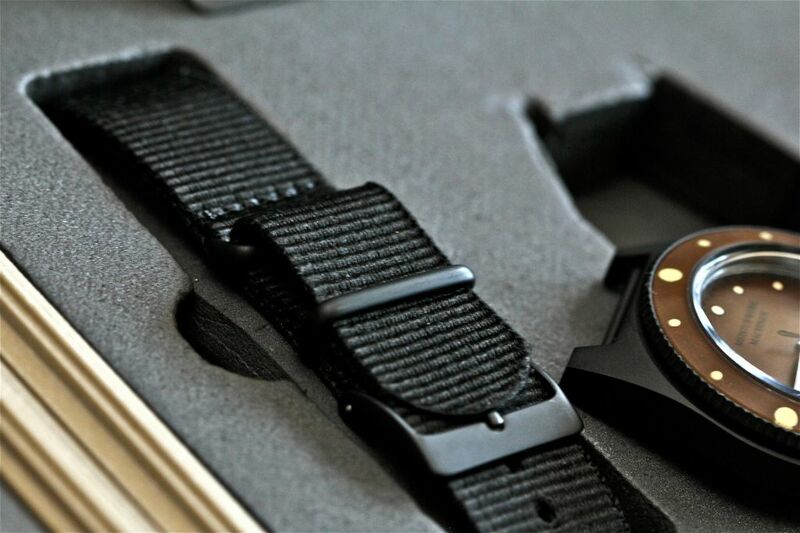 CASE : The MM-01 case was machined from a solid block of 316L Stainless Steel and takes on a simple yet refined shape with fixed lug bars consistent with those of functional historical tool watches. 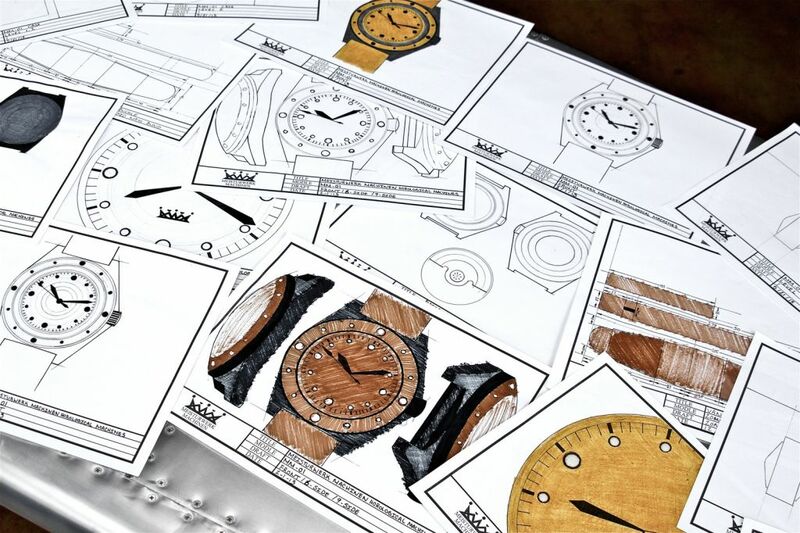 As the cases is precisely finished they then receive their individual engravings followed by a media blasting treatment just before they receive their individual PVD coatings. 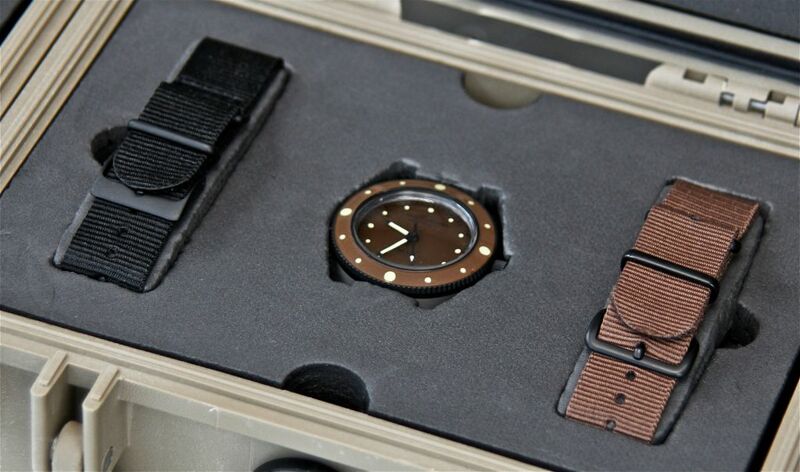 MM-01 case is comprised of three pieces and assembled from the front rather than from the rear as most modern timepieces are. 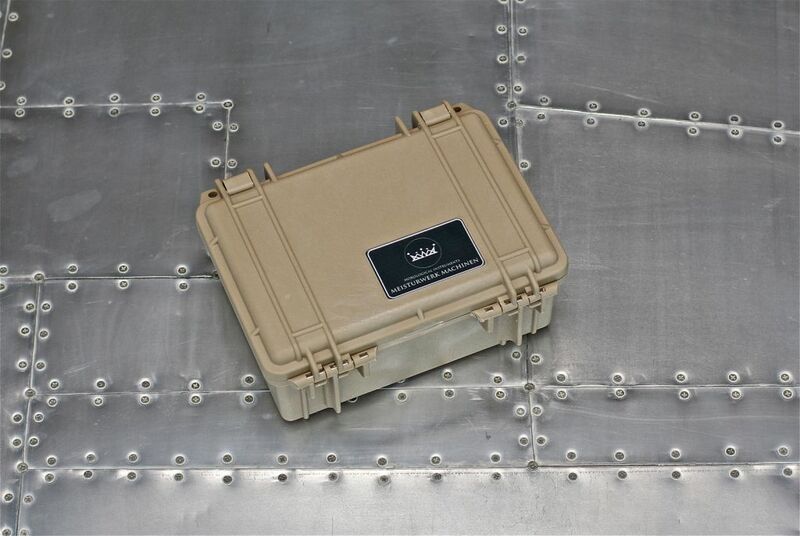 The rear panel is compression fit into the center case to assure water tightness for its pressure testing of 100 Meters. 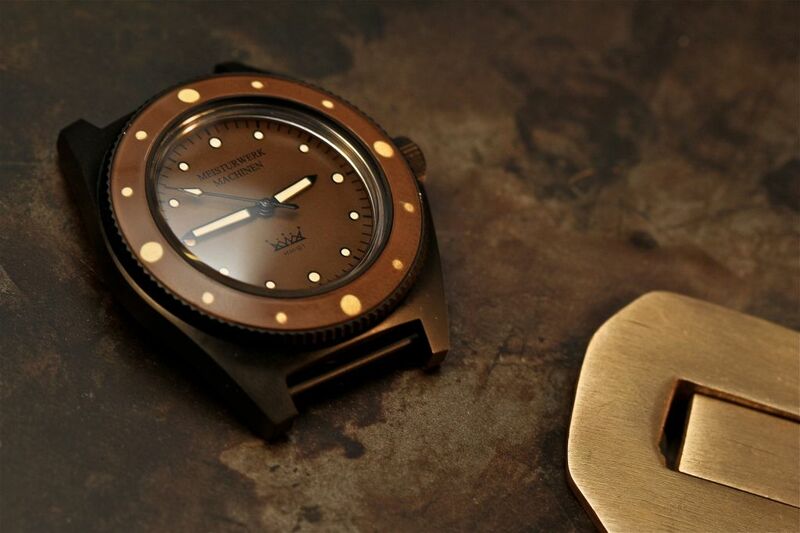 The bi-directional no locking fluted rotating friction bezel, hand painted dial & bezel insert are designed to seek maximum readability while offering excellent grip as this dive watch was designed to be a purposeful tool watch. Heavy gauged gaskets are present throughout. PHYSICAL VAPOR DEPOSITION (PVD) IS A TERM USED TO DESCRIBE THE SERIES OF COATING PROCESSES. 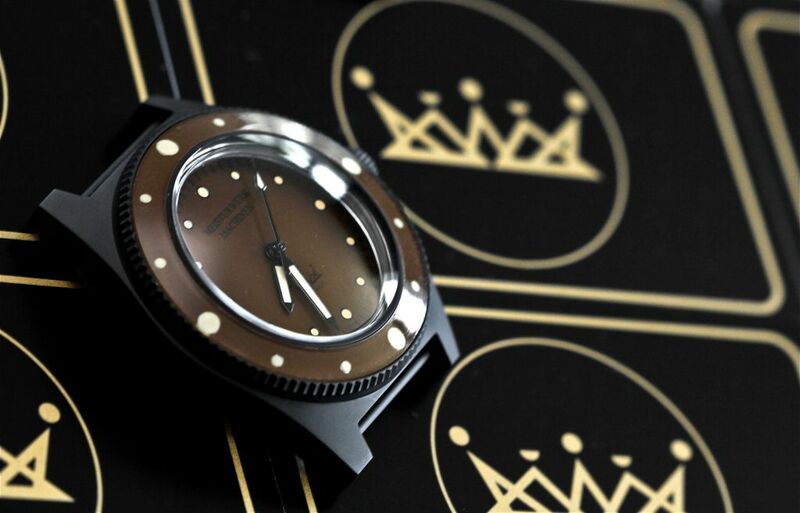 PHYSICAL VAPOR DEPOSITION IS AN ENVIRONMENTALLY FRIENDLY VACUUM COATING PROCESS THAT PROVIDES BRILLIANT AND DURABLE DECORATIVE FINISHES ON THE MM-01 COLLECTION. 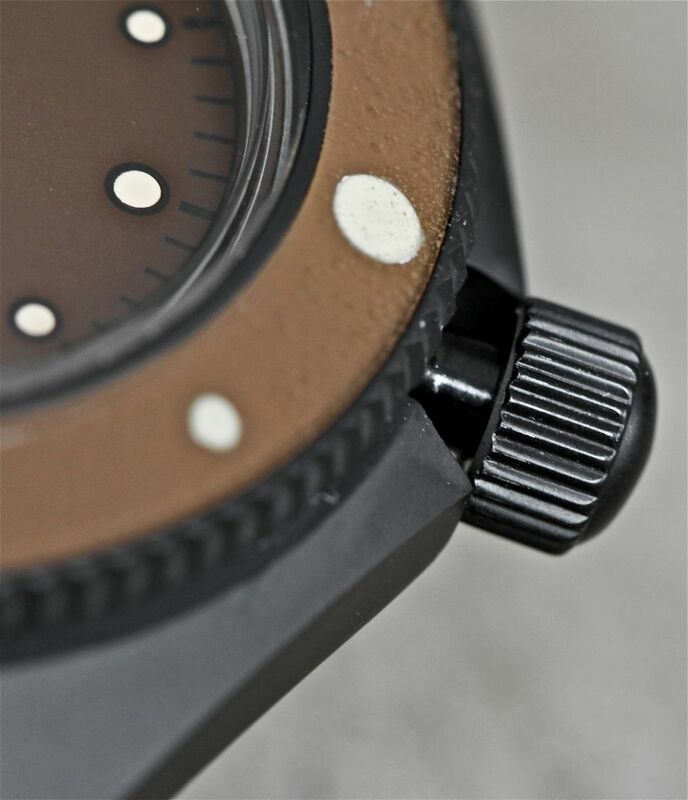 THE A-GRADE PVD PLATING ENSURES THAT YOUR WATCH WILL KEEP ITS APPEARANCE FOR YEARS, ; DO NOTE THAT ANY PLATING CAN BE SCRATCHED AND CONTACT WITH CHEMICALS, COSMETICS AND PERSPIRATION IN SOME CASES CAN PHYSICALLY AFFECT THE PLATING. THE MOST COMMON OF THESE PVD COATING PROCESSES ARE EVAPORATION (TYPICALLY USING CATHODIC ARC OR ELECTRON BEAM SOURCES), AND SPUTTERING (USING MAGNETIC ENHANCED SOURCES OR “MAGNETRONS”, CYLINDRICAL OR HOLLOW CATHODE SOURCES). ALL OF THESE PROCESSES OCCUR IN VACUUM AT WORKING PRESSURE (TYPICALLY 10-2 TO 10-4 MBAR) AND GENERALLY INVOLVE BOMBARDMENT OF THE SUBSTRATE TO BE COATED WITH ENERGETIC POSITIVELY CHARGED IONS DURING THE COATING PROCESS TO PROMOTE HIGH DENSITY. ADDITIONALLY, REACTIVE GASES SUCH AS NITROGEN, ACETYLENE OR OXYGEN MAY BE INTRODUCED INTO THE VACUUM CHAMPER DURING METAL DEPOSITION TO CREATE VARIOUS COMPOUND COATING COMPOSITIONS. THE RESULT IS A VERY STRONG BOND BETWEEN THE COATING AND THE TOOL SUBSTRATE AND TAILORED PHYSICAL, STRUCTURAL AND TRIBOLOGICAL PROPERTIES OF THE FILM. 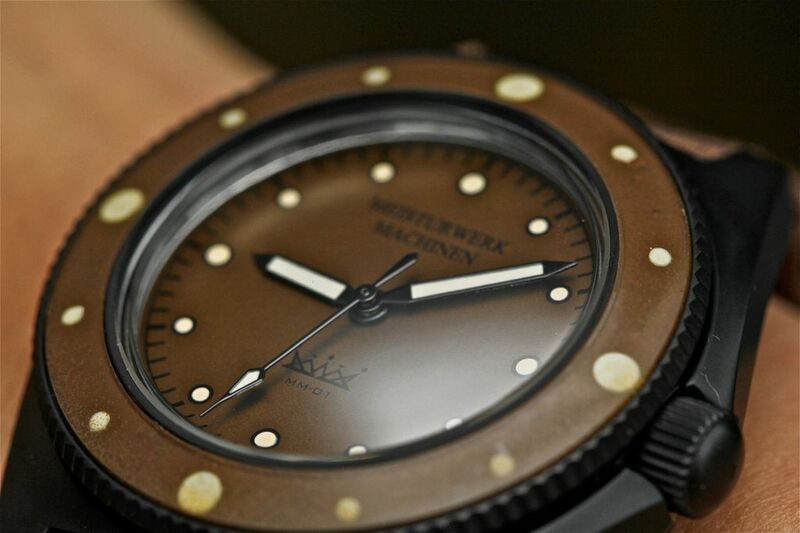 DIAL : The dial housed inside of the MM-01 is hand painted and finished in an Army “Field Drab” brown with minimalistic black text & track as to not draw attention away from the markers which are finished in an Army “Sand” color. 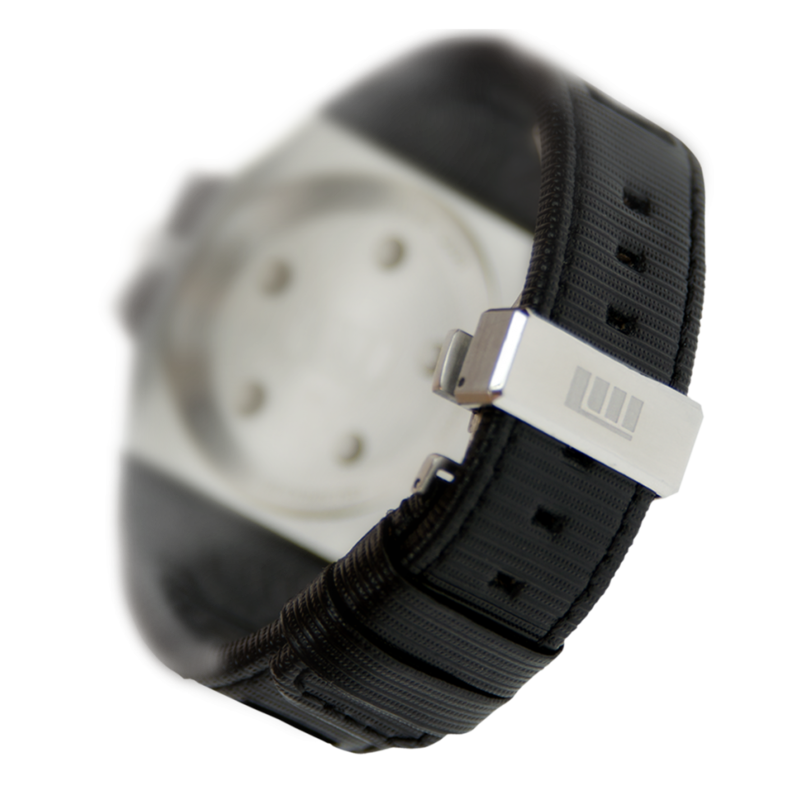 The markers are surrounded by a black perimeter to further their contrast from the dial and again reiterate maximum readability. 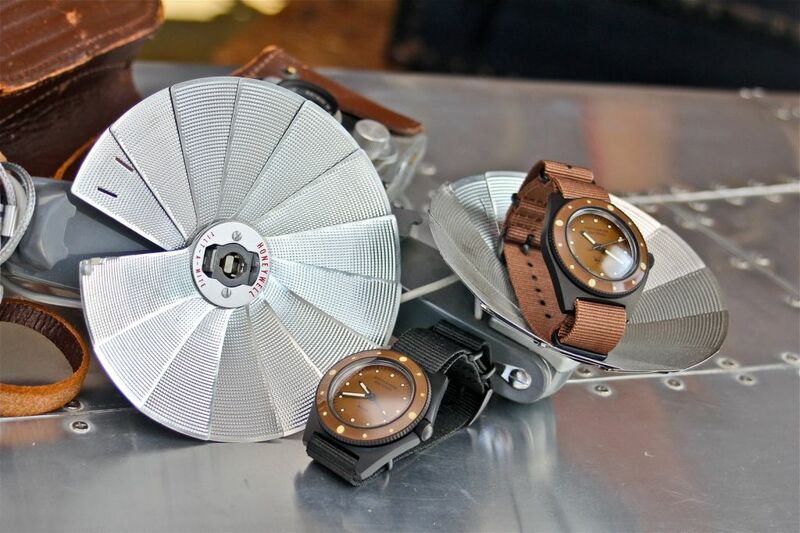 To strength the transition between the colors of the dial & case assembly, the rehaut has been left as exposed brushed Stainless Steel. 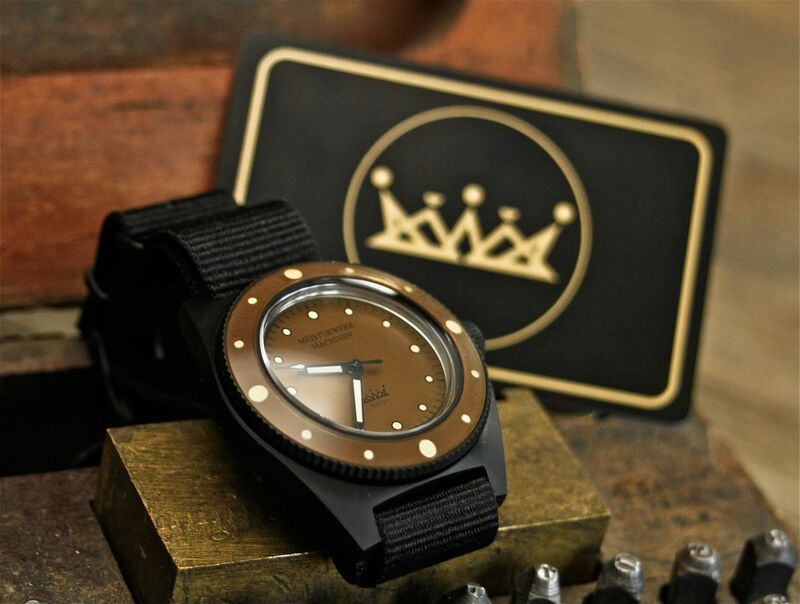 Continuing the colorway theme at hand, the 3 piece brass “necktie” style hand set is hand finished in gloss black with Army “Sand” lume to match the accents of the dial & bezel insert. 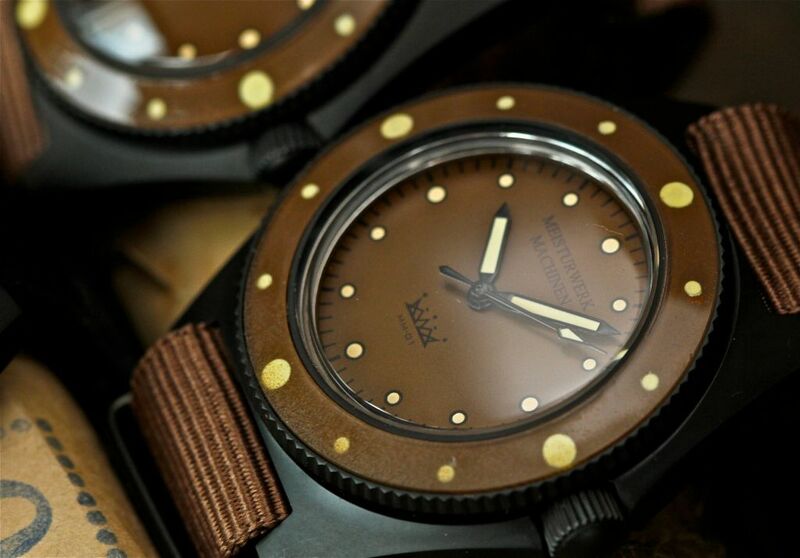 Bezel Insert : The bezel insert is hand crafted and polished from Acrylic. 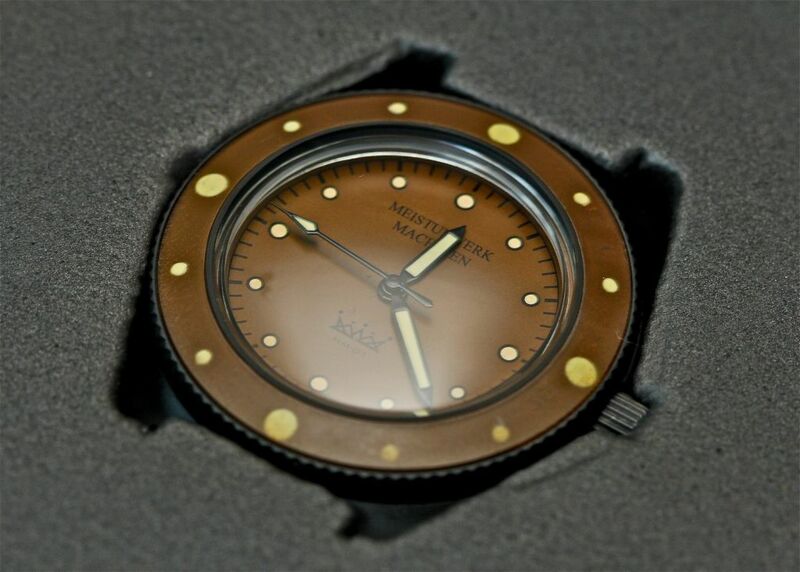 Once completely transparent the insert is first lumed then painted by hand from the back side before it is installed into the bezel and is finished in the same colorway as the dial. 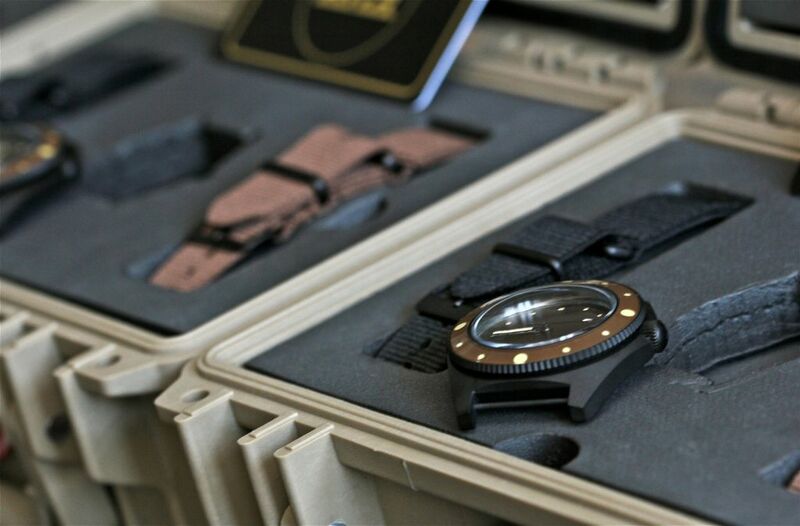 Crystal : MM-01 is equipped with a hand shaped & polished 3mm thick domed acrylic crystal consistent with that of previous issued military instruments. 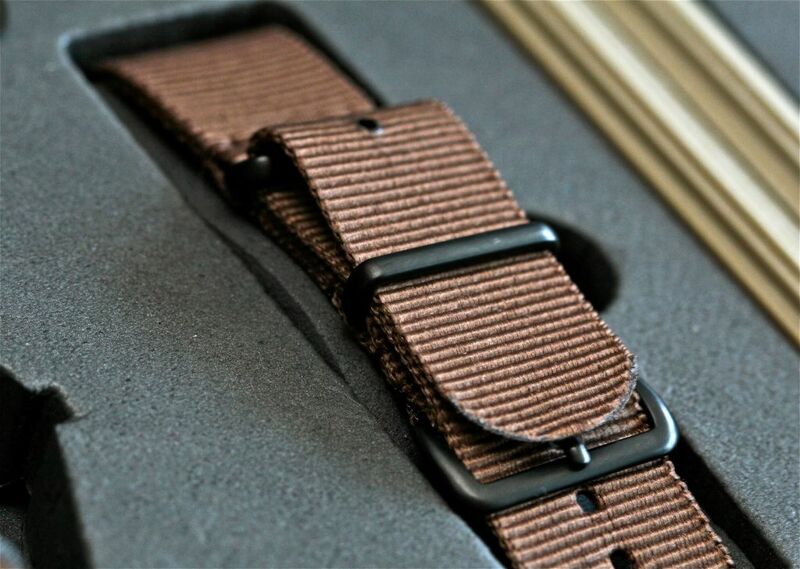 The crystal is threaded into the case again assuring water tightness. 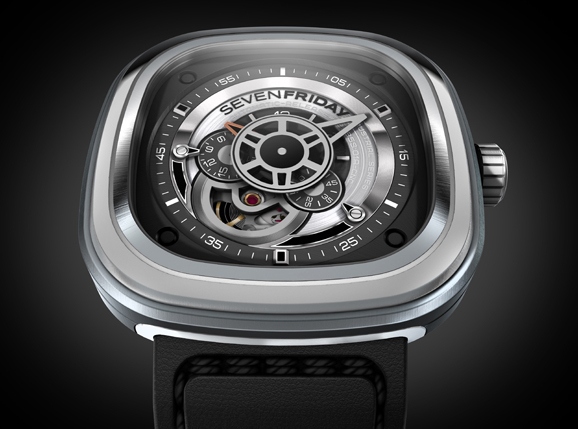 MOVEMENT : The watch is powered by a self-winding mechanical asian (ETA-superclone – Structurally identical to Swiss ETA) 2836-2 gilted movement with Meisturwerk Machinen Monogram engraved oscilating weight and has a power reserve of 40 hours while beating at 28.800 Alt/h. 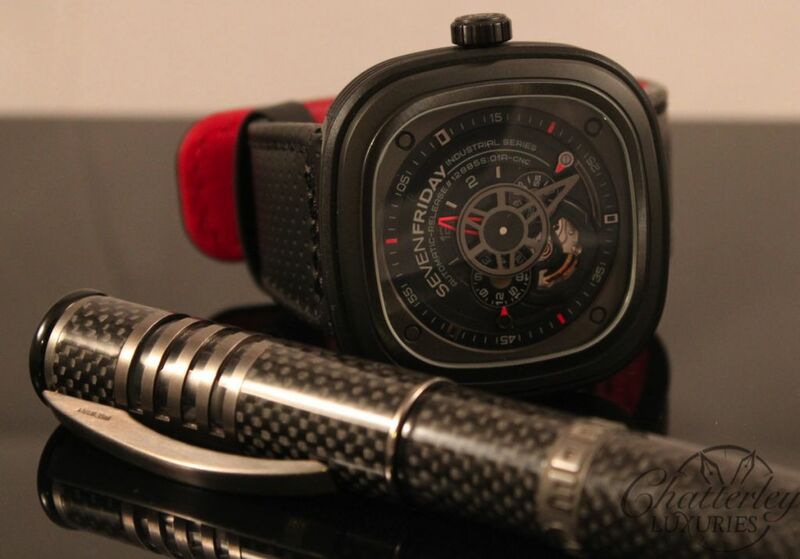 The movement is protected by an anti-magnetic shield constructed between its oscilating weight and the caseback. 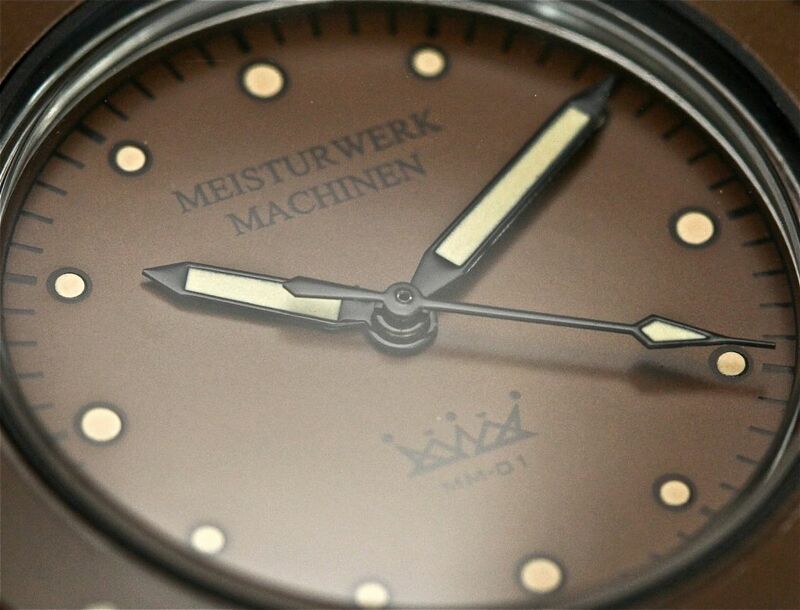 The crown & stem assembly used on MM-01 is a unique 2 piece / 2 position assembly as the watch is loaded from the front which allows no access to the mechanics in the rear with its watertight caseback in place. 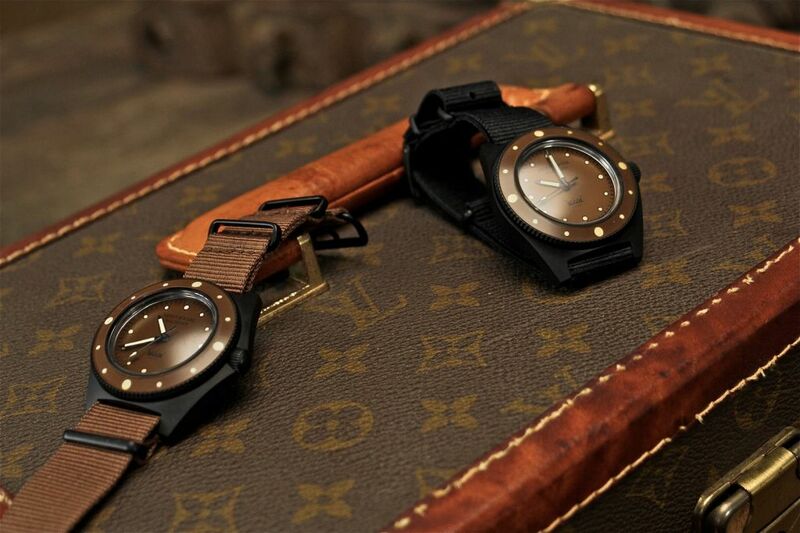 Warranty Card Statement : This timepiece is covered by a one-year international warranty. 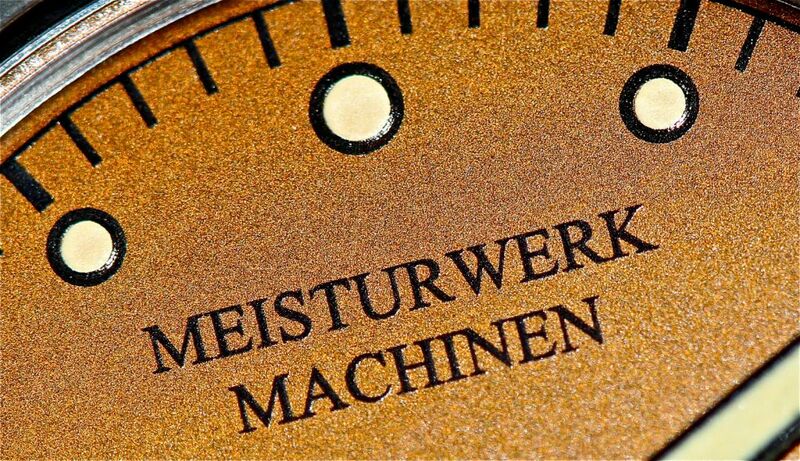 Meisturwerk Machinen will within one year from date of purchase repair or replace (as it’s option) free of charge, the watch movement if it has a manufacturing defect. 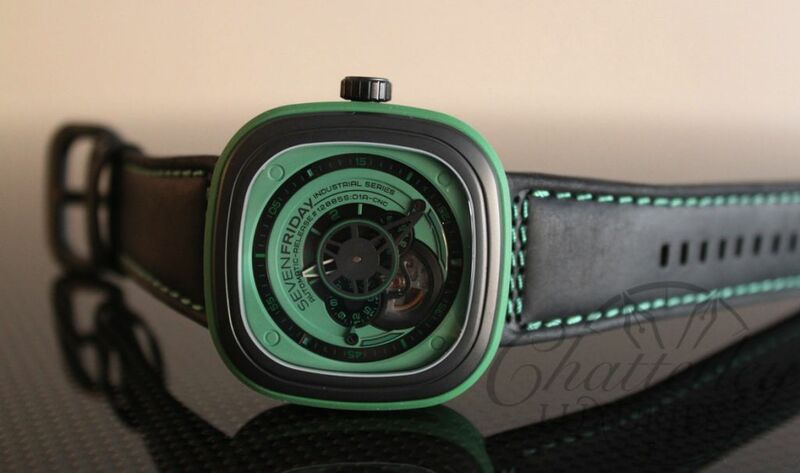 In order to be valid, this certificate must be fully completed and signed by an authorized Meisturwerk Machinen dealer. The warranty is automatically void if this card is broken or lost and is not transferrable. 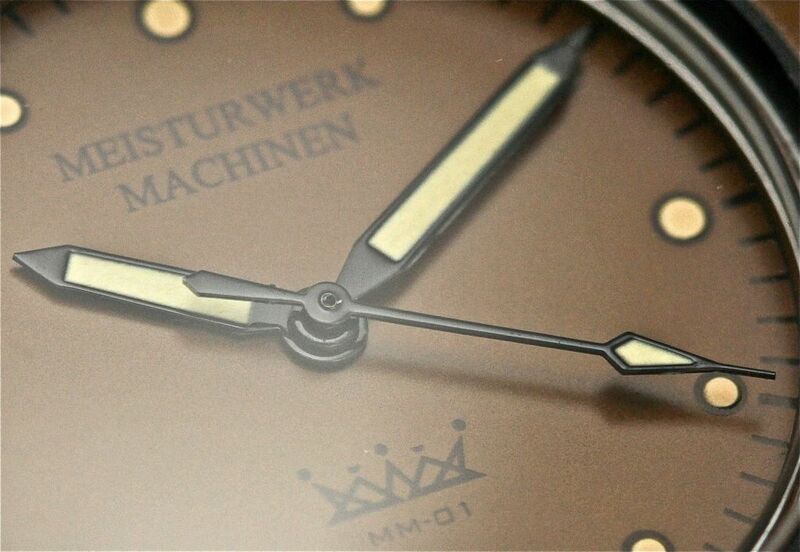 The following are not covered by the warranty : Theft, loss, anomalies relating to a shock, abnormal use, normal wear and aging, incorrect handling, work carried out on the watch by someone other than the Meisturwerk Machinen Service center, failure to comply with the water-resistant control or service.